The president recalled that a debate is a serious discussion, not a show. 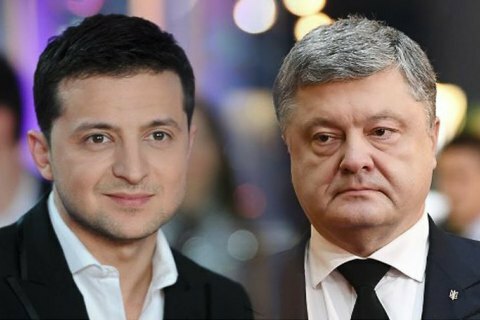 President Petro Poroshenko has agreed to hold an election debate with presidential candidate and showman Volodymyr Zelenskyy at Kyiv's Olympic stadium. In a video published in the early hours of 4 April, he said: "The debate rules are written in the law on presidential election, please read them. They can be held on the basis of Public Television [company] and broadcast by all channels to dozens of millions of people. However, [if you want] a stadium, let it be a stadium. I am waiting for you, Volodymyr Oleksandrovych." The president recalled that a debate is a serious discussion, not a show, and that elections determine the fate of the country for years ahead. "You and I are very different. The needles of our geopolitical compasses point at diametrically opposite directions in the world. My country is a strong European Ukraine which will never kneel before anyone under any circumstances. And a debate is not a show," he said. A day earlier, Zelenskyy challenged the incumbent president to a public debate ahead of the runoff in the presidential election. He set a number of conditions, including that it should be held at the Olympic stadium in Kyiv. Zelenskyy has been avoiding public calls for participation in a debate. A little is known about his geopolitical views and action programme.